Mark Woodhouse, 25 years a Mason. Pictured above from left to right is the Worshipful Master of the Silurian Lodge W Bro. Roger Thompson, W Bro. Chris Evans Assistant Provincial Grand Master and W Bro. Mark Woodhouse. 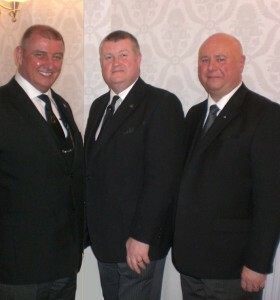 At the meeting of the Silurian Lodge on the 5th of March W Bro. Mark celebrated 25 years membership of the Lodge. W Bro. Mark has been a wonderful supporter of his Lodge during this time although never going through the chair. W Bro. Mark is the IPM of the Lodge of Progress which is a Provincial Stewards Lodge.